Father’s Day has become synonymous with fragrances in many households, as they top the gift chart year after year. Add a “green” twist to the classic gift with Nautica Oceans – the innovative, new water-based scent that is kind to the skin and the environment. Nautica Oceans is the first water-based fragrance that is comparable to alcohol-based fragrances in terms of strength and lasting power. The eco-friendly fragrance is formulated with 100 percent biodegradable ingredients and contains a lower percentage of volatile organic compounds than traditional alcohol-based fragrances. Many men do not wear fragrance because alcohol-based formulas can be irritating to the skin, since it is water-based, Nautica Oceans is kinder to the skin and the environment. The environmentally-friendly outer carton is made from 30 percent post consumer recycled fibers and manufactured using wind power in a carbon neutral facility. The carton carries the following certifications: NewWind Energy, Carbon Neutral® and Sustainable Forestry Initiative. 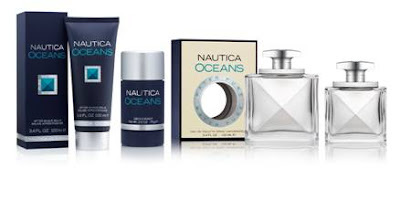 In honor of Father’s Day, Nautica will be introducing a Gift Set in June (presented in a 100% natural fiber toiletries kit), including the Fragrance, After Shave Balm and Shower Gel. The Fragrance 49.00 (50ml) and $65.00 (100ml), After Shave Balm $38.00 and the Father’s Day Gift Set ($68) are available at fine department stores and online at nauticafragrance.com.